Combining graphic notation and conduction gestures with traditional staff notation, these compositions enable large ensembles to improvise together, interacting with the soloists. The instrumentation for the ensemble is flexible. 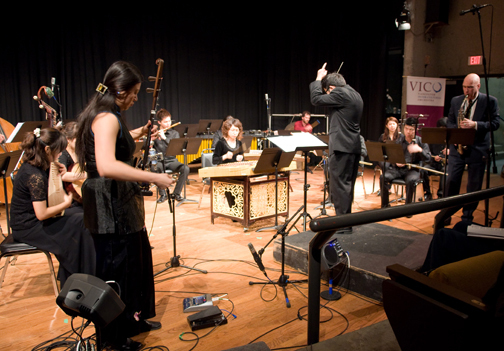 It can cross different genres from classical chamber ensemble, jazz band, to Chinese and inter-cultural orchestras. Much of this repertoire draws inspiration from Lan’s background in Chinese music and, at the same time, incorporates influences from various genres: from western contemporary music, creative improvisation, to various ethnic styles. Her rhythmic intricacy has a direct influence from Indian music, while her passionate melodies from Flamenco and Central Asian music, and the sense of breath/space from Chinese music. She uses elements of traditional music as bridges to connect between Asian and western ears, while experimenting with contradictions by taking culturally specific materials outside their context and fusing them with other genres. She also draws inspiration from ancient myth, philosophy, poetry, paintings, landscape, and other imageries. Incorporating improvisation and graphic notations with Asian traditions, she explores a new territory to discover fresh sounds.